If you have already been entered into our database, you can go directly to our online ordering site. Otherwise, see the directions for ordering below. • Quality All lenses are from the original manufacture, no substitutes or counterfeit lenses. • Fast delivery directly to your address, no backorders. • Pricing is lower than most internet sites. There are no hidden charges. Shipping is free when you order a 12-month supply. • All lenses are 100% guaranteed. Returns are handled at no extra charges (unopened boxes only). • Safe Your personal information (email addresses, credit card info, etc.) is protected and private. No information will be sold or distributed. • Secure online ordering— your credit card information is protected. 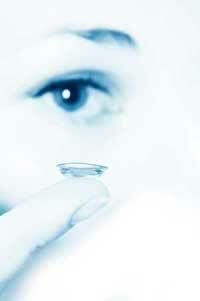 • Services We offer starter solutions and free lens replacements in cases of emergency needs. 1. Patients of University Eyecare who have been to the office after September 1, 2010. You are already in the database and should have received an email with your username and password. Go directly to our secure online ordering page enter your username (email address) and password, then click login to begin your order. If you forgot your password, there is an easy retrieval link on the ordering page. If you need assistance, just call our office (434-293-2048). 2. Patients of University Eyecare who have been to the office before September 1, 2010. You need to call the office (434-293-2048) or send an email requesting to be added to the database. Once we add you to the database you will receive an email with your username and password. Then, go directly to our secure online ordering page enter your username and password to login and begin ordering. If you need assistance entering your prescription, you can call the office (434-293-2048). 3. If you are not a patient of University Eyecare. You can still use our online ordering for your prescription contact lenses! Go directly to our secure online ordering page and click “Sign up Here”. Fill out the Sign Up form and be sure to Check the box “if your prescription is with another office” and fill out the required information. Click Submit and you will be logged in and can begin ordering. Once your order is submitted we will verify your prescription with your doctor before processing. Call our office for further assistance (434-293-2048). FREE shipping* and FAST delivery! *Free shipping available when you order an annual supply.